My mouth dropped open when my daughter repeated the “joke.” It was the same reaction my daughter had when she heard it. The older she gets, the more she speaks her mind, but this time she was shocked and literally rendered speechless by such crudeness. I'm sure her feelings were accentuated by the fact that she had been reading The Boy in the Striped Pajamas, a book about the Holocaust. But even more so because two of our dearest friends are Jewish. In fact, they are more like family to us than friends. "How could anyone make fun of such a tragic event?" she wondered out loud to me. And then she said, "All I wanted to do was cry when I heard it, so I sat there stunned trying to hold back my tears." Thankfully, two of her best friends, who happen to be boys, jumped in and basically jumped down the girl’s throat. They asked her how she could even let something like that come out of her mouth and told her that it was not funny on any level whatsoever. After class, the girl who had told the joke was tripped by someone (whether inadvertently or on purpose, I don't know) causing her to fall down. When my daughter saw her on the floor, she said, “I thought for a split second, ‘Good, you deserve to be on the floor.’ But then I saw that no one was helping her up. 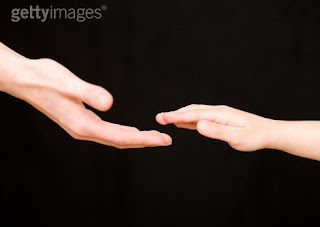 So I reached out my hand and helped her up.” And with that, she concluded her story. At which point, I was the one trying to hold back tears. I used to be a Bible teacher and public speaker. I stopped speaking though when I had my son. That was several years ago. I’ve frequently mentioned to God that the teacher in me was ready to speak again. When and where though I haven’t a clue. But I’ve felt the frustration of not “teaching” others what I know. After hearing how my daughter had helped the girl up, I figured I’d been teaching more than I had realized and to the most important audience I would ever be privileged to be in front of. My children. Yet as I write that last paragraph, I realize that it is a bit misleading. Actually, very misleading. And very pompous. I doubt I would have offered a hand to help the girl up; back at age 14 or even now at age 45. In fact I know I wouldn’t have helped her up. So in reality, my daughter “the student” has quickly become my teacher. When I see the famous Martin Luther King, Jr. quote which says, "Darkness cannot drive out darkness; only light can do that. Hate cannot drive out hate; only love can do that," I cross my arms and say "Humph!" I relate more to Bruce Cockburn who said, "Gonna kick the darkness 'til it bleeds daylight." It's people like my daughter, though, who remind me that sometimes offering a hand to lift someone up is a better way to "fight" than knocking them down. And perhaps offering a hand is more than a physical act too. Perhaps in some unseen cosmic way it helps lift that person's soul out of the mire and muck of ignorance that he or she is stuck in. Ecclesiastes 3 reminds us that there is a time to fight. My daughter reminded me that there is more than one way to fight. Also, the Hebrew translation of Psalm 89:3 says, "The world is founded (built) upon kindness." I was humbly reminded by my daughter that it usually takes more strength to help a person up than to knock them down. It takes strength to be kind. And there is no doubt that she is much stronger than me.